Richard Branson shows off a model of LauncherOne during his announcement (Credits: Mark Chivers). 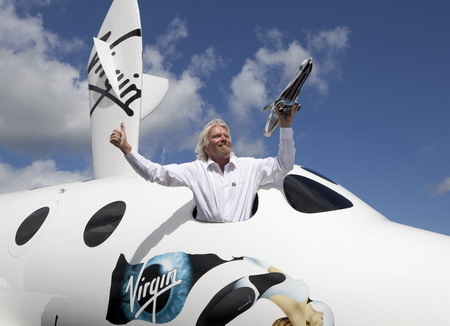 On July 11 2012, at the Farnborough International Airshow, Virgin Galactic founder Richard Branson announced LauncherOne, a satellite launch vehicle designed to put small satellites of approximately 225kg into Low-Earth Orbit. The rocket will be air launched by Virgin Galactic‘s carrier aircraft WhiteKnightTwo. According to the company‘s website, costs are expected to be below $10 million in order to be accessible to smaller companies and researchers. LauncherOne has already attracted customers such as the Earth observation company Geoptics, Spaceflight Ltd., Skybox Imaging, and the astroid mining company Planetary Resources , all of whom were present at the annoucement. Richard Branson also unveiled the company‘s schedule for suborbital flights on SpaceShipTwo. In addition to LauncherOne, the company is testing the spacecraft SpaceShipTwo to bring people to the edge of space by December 2013 on suborbital flights. Already 529 people have signed up for flights, at the price of $200,000 a seat. Currently, SpaceShipTwo is being tested in the Mojave Desert of California; it is expected that Virgin Galactic will begin commercial flights of LauncherOne by 2016.